This statement does not mean that I do ALL these things at ALL the right times- I am just an imperfect human being who is always learning. Besides all the psychology of the matter, Indians are really harmless. Most of them would not hurt a fly. If you go into big cities, big cities bring violence and crime so it is natural for there to be bad people. On a whole, Indians are not violent people and they do not want to be or know how to be. Most are very passive and are not assertive or aggressive people. They will just let you address your concerns and sit in silence or try to verbalize their feelings. It is a sad thing to see people not voicing their opinion, especially with women not speaking up for themselves. Women can be very strong figures in the household, but still do not fully advocate for their own voice and rights. Do you ever find yourself feeling hungry for something, but you don’t know what. Sometimes you are left starving for something to satisfy a craving. I feel so hungry sometimes, but I have to sit with myself and ask what I am really hungry for? Am I physically hungry or am I just satisfying another feeling? One may not be identifying what we are clearly feeling and using food to fill the void or gap, which I do frequently. Being able to identify a feeling can bring us closer to what we are truly craving. If I am experiencing sadness, it may be spirituality I am craving for or support of others to help me cope with this feeling. If I am experiencing impatience or annoyance, I need to usually just let myself sit with those feelings and identify what triggered these feelings. Sometimes our bellys are full with food, but we are craving something more. Most of the time I am truly craving love, affection, and spirituality. Spirtuality,physical hunger,time, a mental break, love, shelter, a specific need or want, or attention. One needs to be able to filter through what they are actually craving. What are you hungry for and how do you filter through what you are truly craving for? The 20th Century has been a century of a multitude of hardships for the Kurdish people living in their indigenous regions. In Turkey, Kurds have suffered cultural discrimination at the hands of the Turkish government. The Turkish government refused to recognize the Kurdish population for most of the 20th Century since the founding of the Turkish Republic, and instead referred to its citizens of Kurdish descent as “mountain Turks”. Until the late 1990s, the Kurds were unable to speak their own language publicly and there are still restrictions defined in the Turkish constitution restricting use of the language in public and political institutions. Today, while cultural rights are still mostly withheld, a seemingly unending economic problem exists in the Kurdish southeastern region of Turkey with unemployment levels reaching as high as 70%. A prime contributor to this problem may be the millions that have been displaced as a result of the ongoing conflict between Kurdish rebels and the Turkish military. In the late 20th century, as many as 4000 villages were destroyed by the Turkish military – according to the Internal Displacement Monitoring Centre – causing over 3 million to be displaced with no government compensation. In Iran, Kurds have also suffered economic hardships. The region in which the Kurds live has been described as among the poorest and least development regions in all of Iran. Kurds in Iran successfully established a semi-independent state with Soviet backing in the mid-20th century. However, the “republic” fell within a year and its leaders executed when the Soviet Union withdrew its forces from Iran. During the decades that followed, the monarchy put several limits on the social and cultural activities of the Kurds in Iran. 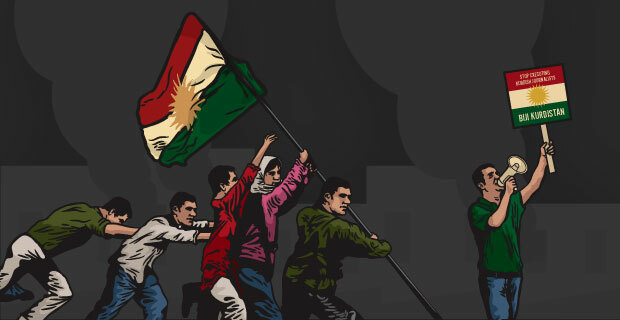 Following the Islamic Revolution, the newly established theocratic regime suppressed the existing Kurdish movements and executed several Kurdish leaders in the following years. In the early 21st century, Amnesty International released a report stating that Kurds were the most targeted ethnic group in Iran, noting that the majority of executions per year are carried out against the Kurds. Many Kurds who have been arrested and executed over the years have been political prisoners and human rights abuses continue to today. The amount of suffering that is experienced by the Kurdish population is extremely traumatizing and psychologically offsetting. When people encounter severe trauma, it is normal for the feeling of "anger" to erupt like a volcano. Anger is one of the easiest feeling for a human being to identify with due to other feelings not being exercised. For instance, if someone is encountering daily suffering and sadness, they have repressed their feeling to be happy. The anger is completely a normal reaction to such threats to ones religious and ethnic identification. The oppression they encounter is highly threatening to their identity and their ability to live life in a healthy manner. But what if these people are just not allowing themselves to be happy. How long can you hold on to anger without forgiveness? At what point do you say, "I deserve to be happy." The Kurdish population does have strong relations with family and this allow them to endure these difficult struggles, but that anger still lies within the self. It's all they know to be angry and hateful towards what happened to them and the discrimination that still continues. This mainly applies to those who are currently living in the Southeastern region of Turkey. They don't have the freedom they deserve and they live in anger with the current political and social situation. It's not fair for these people to live like this, but this is the reality of their region. It's best to try and live happily within your own family and self. Living in anger is not a solution to any violence. She Left Him at the Bus Stop..
After Bursa, I was planning on heading to Istanbul to work with a family teaching English for 2 weeks and then I would head to Adapazari(2 hours) away from Istanbul to teach English with another company(the big company I originally planned on coming to Turkey to work for). The day I left was the last day of school and things were a bit rushed. I had just made the bus leaving at 5:30, which was scheduled to arrive in Istanbul at 9:30pm when he would pick me up. The metro bus(the worst bus in Turkey) arrived four hours later and I had switched buses three different times in Istanbul. If I told an average, normal Turkish guy that I had been on three buses and I was confused on where I was going next, the average Turkish guy would tell me "Stay where you are, I am coming." Mr. Bigg tells me to just take the bus after it was already 11:45 and the bus would take another hour or so to get there. Keep in mind I have not seen him in almost two years..Does anyone see a problem with this? I do. Instead of being excited to see him, I was feeling disappointed and annoyed with the whole bus situation. He was waiting at the final station and after being walked around the station to the wrong bus and then back- I just called him and told him to not wait for me and said, "Go home." I said it pretty rudely too, which did not make anything better. Being a stubborn man/boy, he hung up the phone on me. These guys from the metro bus company offered to give me a ride to the bus station, but I had decided to just go to my friends house that was nearby. Driving in the car with these annoying guys asking dumb questions, it hit me like a ton of bricks "What did I just do?" "Um we are on our way to Ayazaya and it is too late to turn around." "We can drop you off near the metro and you can take a bus." "We can not turn around on this highway." "But we are in the middle of the highway." Priscilla gets out of the car at 1am and goes off with her backpack into the street. She meets a nice couple who helps her get a dolmush to Alibeykoy. It looks like Priscilla is his last and only customer. Being extra nice, she makes friends and he says he will take her to Taxsim-Beyoglu. I sit in Taxsim texting him from a strangers phone and get no response. It is raining, my cute outfit is getting all dirty, and I am sitting in the middle of Taxsim looking hopeless. These nice boys sit with me as they feel bad and do not want to leave me. I end up staying with a stranger-yes a stranger who happened to be a very nice guy-I call him my Mr. Mercedes who came to my rescue. He picked me up at the bus stop where I just sat waiting for a bus that never came. I stayed with him in his home and he was a perfect gentlemen and he is now a good friend of mine. As for Mr. Bigg, he did not ever respond and he did not respond to anything I wrote for one whole month-stubborn, stubborn man- Arab-like yes. Angie was my "team teacher." We both taught the same students so we created our curriculum together. We worked hard making creative activities, utilizing all her teaching supplies(she came super prepared),and we were so enthusiastic about our students learning and improvement. Bursa is quite charming with lots of beautiful mountains, view points, cafes, restaurants, and historical buildings. My girlfriend and two new friends of ours drove to Mudanya, which was quite scenic driving along the coast. We past many olive trees, enjoyed chai, fish, and munching on sunflower seeds. Priscilla tried to learn how to open a sunflower seed with her tooth,but kept failing again and again ha. While I did not run around the all the museums and all historical sights, I just kept things simple in Bursa. I visited the mosques, tombs, castle, and some great historical areas turned into shops and art galleries. I met the most lovely artist in town and we talked and talked via google translate. My overall experience was quite successful with my lovely 6th grade class. 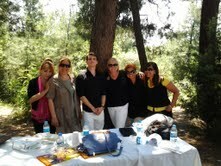 The students I absolutely adored. At first, they were a handful like most students are in the beginning. They test their boundaries with the teacher and see just see how much they can get away with. My students do well because I gain their respect. Respect is something that works both ways with all human beings and even animals. With children especially, when you respect them and treat them like little adults, they respond very well. Naturally, teachers have their favorite students and mine were basically all the boys in my class. There were the most adorable set of twins(handsome and very smart). One can not help, but wonder what these boys will become when they get older. Asim and Atif were my also my two favorite boys. Atif was always enthusiastic and dramatic when trying to explain something in English only as no turkish is allowed in the classroom. And of course, there was my adorable chunk of love Sahim. He was overweight with black square glasses and he was very shy, but always very polite. He would always smile big and offer me some of his chocolate wafers-priceless. My other class was not as great as my first class, but they respected me, which resulted in great lessons, enthusiasm, and participation. The girls were chatty and not as enthusiastic as the boys, but it is all good. The last day of class we were playing games, eating marshmallows, and dancing to the party rock anthem(boy that video is addicting). I still do not know how to fully do the dance. My team teacher, Angie, picked it up faster than me ha! The principal, Mr. Fahie, was always so kind and had the cutest mannerisms. He would always squint and be walking around the school looking confused, but he knew what he was doing. He took us to the Whirling Dervishes dance one night as a school outing. 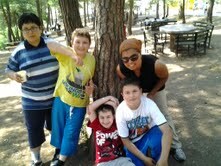 We also went on a picnic with the students and took them to a lake for fishing.